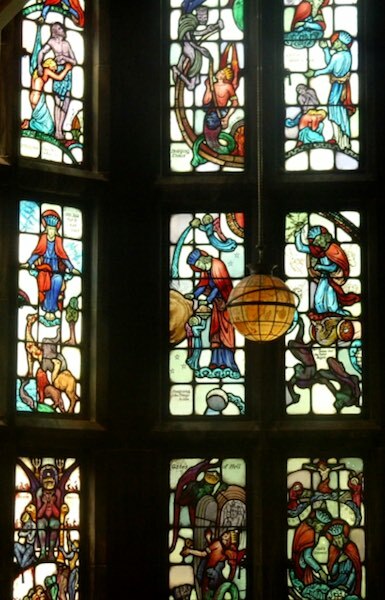 Portraits of John Milton and illustrations of his work date from the seventeenth century onwards, but it was not until the nineteenth century that they appeared in stained glass. In the seventeenth and eighteenth centuries, stained glass had become a lost art form, until the Gothic Revival in the nineteenth century. About the speaker: Beverley Sherry is an Honorary Associate at the University of Sydney, formerly a Senior Lecturer at the University of Queensland. Her work crosses the disciplines of literature, history, and the visual arts, with her book Australia’s Historic Stained Glass (1991), one of her most pioneering works. However, the work of John Milton has remained her principal interest in teaching and research. She serves on the standing committee of the International Milton Symposium and the editorial board of Milton Quarterly, and has published widely on Milton since 1975.